Trace amounts of personal care products, antibiotics, and birth control hormones have been found in today's wastewater. While the U.S. Environmental Protection Agency (EPA) has developed guidance to help laboratories determine chronic and acute levels of wastewater pollutants, these permissible levels have focused primarily on conventional pollutants. How are laboratory technicians supposed to measure these additional compounds before treatment or after a remediation process has been put into place? The answer seems to be by using familiar tools together and in new ways. environmental laboratories have become more conscious of productivity issues since the industry has gone through a pricing pressure/consolidation phase in the United States. Still more advances in GC/MS technology have improved detection limits in complex samples. The ability to adjust sensitivity requirements for particular analytical needs makes the system useful for a wider range of applications. Full scan (FS) ion monitoring is by far the most prevalent mode of operation for organic compound detection. It covers the necessary mass range and provides classical spectra that can be compared with those stored in a library for positive identification. Selected ion monitoring (SIM) is a GC/MS mode of operation in which only the ions of interest are monitored without surrounding interferences and coelutions, providing dramatic increases in sensitivity. SIM has not been widely accepted in environmental testing, because it requires prior knowledge of the sample matrix. The combination of simultaneous selected-ion and full-ion scanning for the same injection provides the advantages of both techniques in a single chromatographic run. Injecting a larger amount of the extracted sample for semivolatile samples also can increase sensitivity. Large volume injection also may decrease the sample preparation required, saving time and labor. When used with solvent purging, large volume injection maintains chromatographic integrity. Wastewater analysis presents a unique set of challenges. The suite of compounds to be measured varies by industrial category and may consist of a few or many compounds. The matrix components and complexity may be as simple as drinking water or as complicated as a hazardous waste extract. The concentrations to be measured will vary, so a method that could analyze wastewater having more than one source discharge must be able to cover a wide range of requirements. One way to evaluate the potential for meeting these requirements is to examine the two possible extremes. Drinking water requirements for low detection limits reflect the levels that might be measured in ambient water for evaluating background levels or modeling a watershed. To demonstrate how GC/MS can achieve low detection limits and meet quality control criteria specified by EPA methods, we tested drinking water and a hazardous waste extract. A large suite of compounds are included in drinking water methods, demonstrating the breadth of analytes that might be examined. 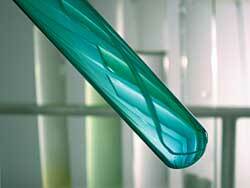 The ability to handle a more complicated matrix is routinely required in solid and hazardous waste analysis programs. We will describe the techniques used to accommodate a more complicated matrix. The EPA method for semivolatile organic chemicals in drinking water (Method 525.2) was developed in 1988 using technology that was, at that time, state of the art. The concentration range specified for measurement in the method ranges from 0.1-10.0 nanograms per microliter (ng/µL). Cheri Coody et al. have demonstrated compliance with the requirements of Method 525.2, such as method and sample quality control objectives, for drinking water. The following analysis conditions (Table 1) show the GC/MS parameters required to measure drinking water at the enhanced sensitivity. This work was done by E.A. LeMoine. The system is optimized for the lowest detection limits and calibrated from 0.02-1.0 ng/µL. EPA has developed the solid waste methods for more complicated matrices that might be encountered during hazardous waste cleanup or monitoring. LeMoine et al. evaluated Method 8270, an EPA method for measuring semi-volatile compounds in hazardous waste. Identical standards were analyzed using two sets of experimental conditions. A 50-µL large volume injection was used in both cases. One set of standards was analyzed using the GC/MS FS-50 and the second using SIM-50. Table 2 lists the chromatographic and mass spectrometer conditions used for both experiments. Enhanced sensitivity using the semivolatile drinking water method is shown with a calibration curve for one component (Figure 1). The practical quantitation limits are compared to the maximum contaminant levels (MCL) in drinking water (Table 3). The quantitation limits are well below the level where a decision would be required. In fact, the levels are low enough that, for the majority of compounds, a tenfold reduction in the MCL could be reported reliably. The challenge with a more complicated matrix is to maintain detection limits with the introduction of additional potentially interfering components. Newer MS technology has evolved to better address these considerations. For example, one advance incorporates a prefilter to remove unwanted material before it proceeds to the analytical quadrupole. In addition, the detector is sealed to prevent contamination, making the system more rugged for dirty samples and requiring less frequent cleanup or maintenance. Large volume injections can increase sensitivity, but the increased solvent can degrade chromatography and hamper system cleanout. Solvent purging (before the analytes of interest are introduced into the column) can provide an efficient analysis of a larger volume sample, allowing less preconcentration and providing enhanced sensitivity. Figure 2 shows how solvent purging works. The solvent purging mode was used with the solid waste extracts, while injecting 50 µL of sample. Figure 3 shows the pattern recognition possible and selected ions for toxaphene. Selected ion monitoring is a demonstrated technique for increasing sensitivity, while a full scan is useful for pattern recognition to confirm analyte identification. The use of both techniques on the same chromatographic injection provides primary and supporting information for an accurate identification at lower concentrations. The detection limits obtained in each mode are compared in Table 4. Toxaphene MCL: 3 micrograms per liter. Detection limits equivalent to ppb (µL/L) for a 1-L sample concentrated to 1 mL. When endocrine-disrupting compounds are combined with traditional pollutants, other aspects of analysis become more difficult. One consideration for some of the higher-molecular weight compounds, such as brominated flame retardants, is the need to calibrate with a high molecular-weight material to provide more accurate results. W.D. Goodman et al. and K. Usukura et al. provided a mechanism to calibrate with high molecular weight compounds. A typical flame-retardant analysis will produce ions to 970 mass units (u). To achieve accurate mass calibration in the upper half of this mass range (600-1200 u), a technician must use an alternate mass calibration standard with known ions greater than 600 u. This high mass calibration technique uses a GC injection of the calibration standard triazine, which produces ions up to 1,185 u, allowing calibration of the full mass range. Wastewater's suite of analytes can vary in number and content and the detection limit requirements can be difficult to achieve. Large volume injection and enhanced spectrometer performance can be used to enhance method sensitivity. Coupled with modern techniques to handle complex matrices in the spectrometer, wastewater analysis becomes more productive when using GC/MS capability and flexibility. 1. Coody, Cheri, Michael J. Burke, and Elaine A. LeMoine. 2000. “U.S. EPA Volatile Organics Method 524.2 Using Purge and Trap GC/MS,” PerkinElmer Application Note D-6224. 2. LeMoine, E.A. 1998. “Semivolatile Organics in Drinking Water using EPA Method 525.2 Optimized for Greater Sensitivity,” PerkinElmer Application Note D-5886. 3. LeMoine, E.A. and H. Hoberecht. 2000. “U.S. EPA Method 8270 for Multicomponent Analyte Determination,” PerkinElmer Application Note D-6346. 4. Goodman, W.D. and H. Grecsek. 2006. “Analysis of the High Molecular Weight Flame Retardants - Polybrominated Diphenyl Ethers (PBDEs) by GC/MS,” Poster at Pittcon Conference. 5. Usukura, K., T. Seko, and N. Onda. 2001. “Quadrupole GC/MS Analysis of Polybromodiphenylethers Ranging to m/z of 959,” Analytical Sciences, (17) Supplement, p.579.